This tropical inspired cocktail is actually the love child of some left over fruit salad, a battle with my cable company, an unusually hot and humid day and a desperate need for a cooling smoothie. Now, when I'm talking hot, in Arizona that means HOT, like temperatures in the triple digits with ranges of 105° to 118°. 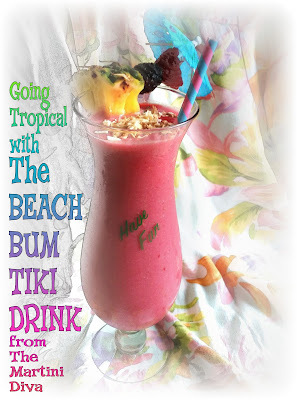 That kind of heat gets a person thinking about beaches, and beaches get me thinking about Tiki cocktails. As I grazed my refrigerator for more ingredients for my boozy smoothie, I spied some fresh pineapple and the cream of coconut. Along with some falernum syrup, and a nice assortment of rums, I was amply prepared to transport myself from the hot Arizona desert to a Tiki Bar paradise right out on my own front deck. Heck, I was already surrounded by sand (okay, sandy clay), so all I had to do to get away to Tiki Land was stick a cocktail umbrella in my drink, don some flip flops, turn on a fan and find some Don Ho on Pandora. Aloha. TOOLS: Jigger, Blender, Hurricane Glass, Cocktail umbrella, Vivid imagination. INSTRUCTIONS: Add all your ingredients into the blender and pulse until the ice has been thoroughly blended and you have a smoothie consistency. Pour into your hurricane glass, garnish and enjoy. If it helps ... feel free to add a cabana boy and a grass skirt to the mix.